On 22nd November 2017, ERGO Director Jamen Gabriela Hrabanova took part in an event of the initiative Community Living for Europe: Structural Funds Watch, where a report on the use of EU funds for community leaving was launched. The event took part in the European Parliament and was co-hosted by Mairead McGuinness, MEP (EPP) and Vice President of the European Parliament and Iskra Mihaylova, MEP (ALDE) and Chair of the European Parliament Committee on Regional Development.Regarding children, evidence shows that a caring and protective family, immediate and extended, is central to a child’s health, development, and protection. Community living is a human right, recognised under European and international law. However, Roma children are overrepresented in institutional care, confirming that poverty is the chief cause of children being separated from their families and placed in institutions. The report analyses the role of the European Structural and Investment Funds (ESIF) with respect to the transition from institutional to community-based living for children and young people, including those with disabilities, adults with disabilities and older persons in EU Member States. It contains examples, both positive and negative, that demonstrate how the Member States have implemented the ESIF regulations, how they are currently using or are planning to use the ESIF to support the transition to community-based living, and provides concrete recommendations for the current and next funding period post 2020. Jamen Gabriela Hrabanova from ERGO Network brought the Roma perspective to the launch event. Children and young people make up almost half of today’s Roma population in Europe (around 35.7% under 15 years compared to 15% of the majority population). Investing in deinstitutionalisation is therefore an investment into Europe’s future generation that will yield very high returns. There is however a lack of preventive measures to stop institutionalisation of Roma children, as the number of social workers who support discriminated and poor families is insufficient and investment into community projects is extremely scarce. She pointed out that new kinds of services need to be created that are adapted to the needs of the people, who should be involved in the design of these services. Only when beneficiaries have their say, the use of European Structural and Investment Funds can really be effectively used for social inclusion measures. This must of course include Roma beneficiaries, as they are often a main target for social inclusion measures. 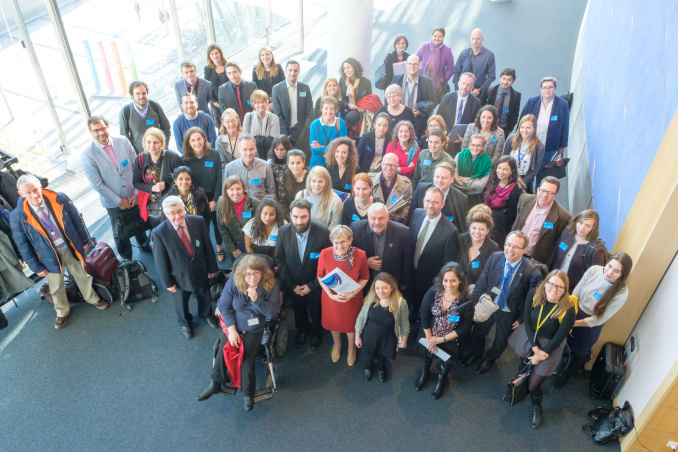 The initiative Community Living for Europe looked in particular into the effect of the ex-ante conditionality 9.1 that demands Member States to invest in de-institutionalisation when using European Structural and Investment Funds. Also for Roma an ex-ante conditionality (9.2) is in place. It demands Member States to have a national Roma integration strategy in place if they want to access ESIF. As with conditionality 9.1. on active inclusion however, also in the Roma field having a strategy in place does not mean that it will also be implemented. A change in policy is therefore necessary that puts more emphasis on quality of implementation of social investment measures in EU member states. ERGO and its member organisations will continue to monitor the use of ESIF for the social inclusion and poverty reduction of Roma and greatly appreciates the report issued by Community Living for Europe: Structural Funds Watch.